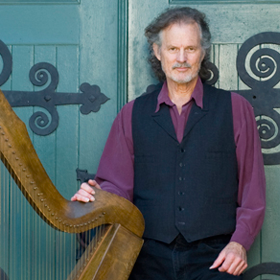 Patrick Ball is considered one of the premier Celtic harpers and spoken word artists in the world today. Born and raised in California, he gave little thought to where his ancestors came from. However, he found he was irresistibly drawn to the lyrical and turbulent history of Ireland. Ball fell in love with the eloquence and fire of the Irish oral tradition and the Celtic harp. Patrick’s concerts are a captivating blend of music and storytelling. He has recorded three spoken word and nine instrumental albums, earning national awards and selling over one-half million copies collectively. He has been awarded grants for his work by the Zellerbach Family Fund and the California Arts Council. He is also the recipient of the Circle of Excellence Award from the National Storytelling Association. Here is a video of Patrick performing "O'Carolan's Farewell to Music."